I am taken by this beautiful piece of art, depicting a family scene. I love that it captures a moment where not all is perfect. The kite needs repair and the boy and his father or grandfather are trying to remedy this situation. The father/grandfather has obviously been working away at his whetstone, perhaps sharpening the tools with which he works his garden plot, seen just behind the fence. There's a watering can there too, as well as a rake, so obviously he's been at toil. 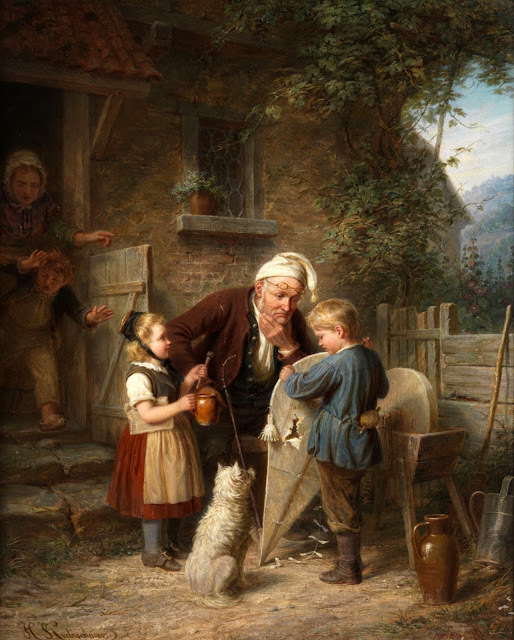 The girl looks as if she's been working too, or at least helping, and has either collected the honey from a hive not depicted, or is offering a cool drink, mug of tea, or other refreshment to help Father/Grandpa with his musings. Under her arm is some needlework or mending, and she is wearing an apron, so she's obviously been doing something useful. We see behind her too, that a third sibling, is being disciplined by Mother/Grandma for sins to which we are not privy, so it's probably a more honest depiction of family life than many antique artworks! Why do I love this painting? I guess it's because unlike many typical scenes, it shows a family at work. A family where each is helping the other. Yes even the son being disciplined is being shown that whatever his misdemeanour may have been, it was unacceptable in this family home, and he must mend his wicked ways. There are tools of labour scattered about, and a harmonious feeling of co-operation is evident. The dog looks well loved and well fed. The garden behind the fence is thriving. There is a pot of herbs on the windowsill, so clearly the garden and kitchen are connected. Everyones clothing, though worn in places, is neat, and suggests a family well loved and cared-for. The male figure cares about the children and is wondering how best to repair the kite, thus teaching the children valuable skills. The female figure is acting disciplinarian, but the child to whom the discipline is being metered out, looks well fed and clothed, and only slightly alarmed. Perhaps he ate the cheese meant for dinner. I certainly don't think his misdemeanour was anything more serious. My elder daughter (now 35) at age 14 told me that I was the meanest mother in the whole wide world and I responded that one day she would be glad that I was. I thought nothing more of my throwaway line until a few years when my darling child who was now the mother of 2 girls commented that she was glad I was mean and how much it meant to her. That meant the world to me. I think it's very important to keep your promises to your children, and be consistent. For example, if I say I will help them with something, talk to someone for them, or protect them, I will do that no matter how inconvenient or uncomfortable it is. Parenting is not easy but we all do the best we can. I was brought up like you, Mimi and that provided a good foundation for my life. A great post. I have tried to teach my children that if a chosen pathway closes, find another. Both have had to do this in their adult lives. Both have said that they knew there was another pathway and that the world didn't end because one direction was closed to them. Resilience is something that I think we need to foster in our babes. In my parenting, and my teaching career, I always believed in finding the children's trigger point. What got them interested and wanting to know more, do more. My son hated reading novels. He loved all things mechanical and finding out how they worked. We bought him workshop manuals and motorbike and 4WD magazines. He still says he hates reading but he always has a magazine or a manual that he is working through. His trigger point and now his career. Our daughter loved calisthenics. On one occasion she had been an unholy terror. She had to ring Miss Barbara and tell her that she couldn't go to Calisthenics as she had been very rude to Mummy. For our daughter her dancing was her passion, her trigger point. Parenting is not easy and does not end simply because your child is now an adult. It is a lifelong commitment. A child is not a fashion accessory to be put aside when the novelty wears off. I like what Jane has done, and appreciate the quote, "Train up a child in the way he should go, and when he is old he will not depart from it." I am grateful that this applies to animals and plants, too!! great post Mimi. Like Fairy both my daughters have thanked me for being "mean". They didn't get everything they asked for, and they did not get the same things as each other due to age and personality differences. Thank you for this! Everything you said is so true. God bless you. Thankyou for a life saving post. I had recently enforced some consequences on my teenage son as a result of not studying or putting in effort. His comments to me implied it was all my fault and I was too old fashioned. etc etc. I have done much soul searching wondering if I had done the right thing and do other parents do this as well. Well so glad to see my ideals are others as well. what a load of crap. Bragging about being mean? Really? Home is supposed to be a safe haven. We teach by example and by encouraging trust and nurturing the hunger for closeness and knowledge. Home is not a training camp for stoic, Stalinlike creatures that can't relate to real people. Ah Anonymous-not-too-scared-to-be-rude-but-too-scared-to-put-your-cowardly-name-to-it. So we meet again. Clearly you have Mummy issues to make such an ill informed comment on a post about rearing children responsibly, and bringing Stalin into the conversation. You poor pathetic creature. My blog, my views, my right to publish comments or not. Excuse my French but sod off. Your inflammatory comments do not get a second airing here. I totally agree with your formula for parenting and have exercised it myself. 2 out of 3 have thrived but one hasn't. If you keep doing the same thing, you keep getting the same result so the foundation stays the same with some variations. A close friend said that my kids provide an interesting study on nature -v- nurture. I'm a great believer in things happening for a reason so I figure that this particular child is my challenge and if his oppositional defiance doesn't kill me then I may live to see him mature and have his own child or children who give it to him in equal measure...although I'm not that mean..lol.